Purchase 50 or more Easiplaster (6cm x 5cm)s and download your free support pack worth £100. Purchase 200 or more Easiplaster (6cm x 5cm)s and you can have personalised covers absolutely free! 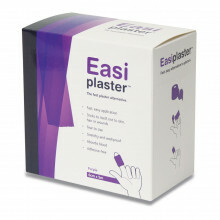 Easiplaster is a fast and easy application plaster that can be placed directly over the wound and wrapped securely. By adding more layers and pressing together, it can contain severe bleeding. Particularly suitable for fingers, hands, arms and even legs.